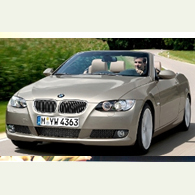 (autoinsidernews) - BMW finally released details for its 2007 3-Series convertible, which features BMW's first folding hardtop. The 3-Series convertible will officially debut at the 2007 Detroit Auto Show in January. Like its coupe sibling, the 3-Series convertible will be offered in 230-hp 328i and 300-hp 335i models for the North American market, while Europe will initially get 325i and 335i models. The BMW 335i convertible will accelerate from 0 to 60 mph in just 5.5 seconds when equipped with the six-speed manual, and in 5.7 seconds for the new six-speed Steptronic automatic transmission. Top speed is electronically-limited to 130 mph 150 mph for models equipped with the Sport Package, reports Trend. Because of the three-piece electronically-operated retractable hard-top, the 3-Series convertible a larger rear glass windscreen and side windows, which improves visibility by 38 percent compared to the outgoing softtop 3-Series convertible. The new 3 also features a new SunReflective leather, which contains special pigments to keep treated areas 20 degrees cooler when exposed to direct sunlight than regular untreated leather.